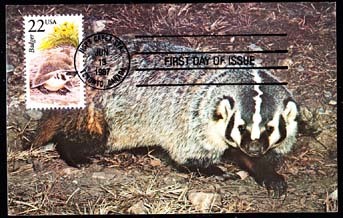 73049 MAX U.S.A. (1987) Badger*. Maximum card with First Day cancel. Scott No 2312, Yvert No 1744. 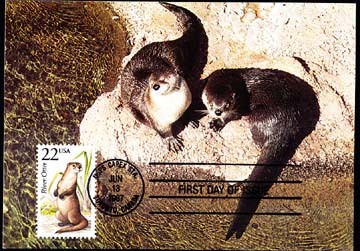 73051 MAX U.S.A. (1987) River otter*. Maximum card with First Day cancel. Scott No 2314, Yvert No 1746. 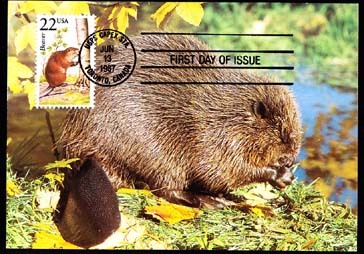 73053 MAX U.S.A. (1987) Beaver*. Maximum card with First Day cancel. Scott No 2316, Yvert No 1745. 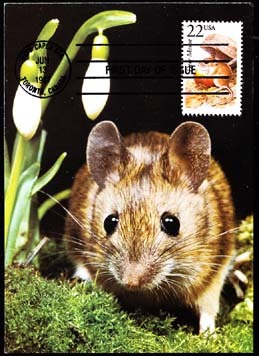 73061 MAX U.S.A. (1987) Deer mouse*. Maximum card with First Day cancel. Scott No 2324, Yvert No 1753. 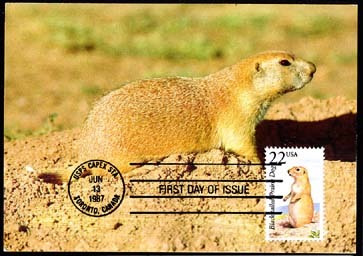 73062 MAX U.S.A. (1987) Prairie dog*. Maximum card with First Day cancel. Scott No 2325, Yvert No 1754. 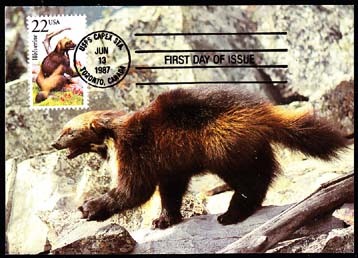 73064 MAX U.S.A. (1987) Wolverine*. Maximum card with First Day cancel. Scott No 2327, Yvert No 1756. 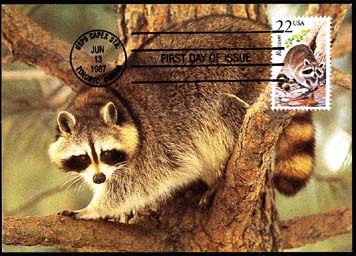 73068 MAX U.S.A. (1987) Raccoon*. Maximum card with First Day cancel. Scott No 2329, Yvert No 1758. 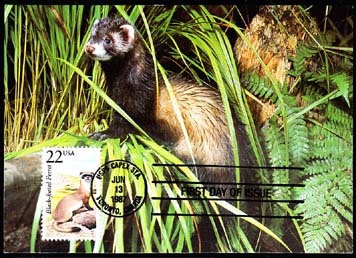 73070 MAX U.S.A. (1987) Black-footed ferret*. Maximum card with First Day cancel. Scott No 2331, Yvert No 1760. 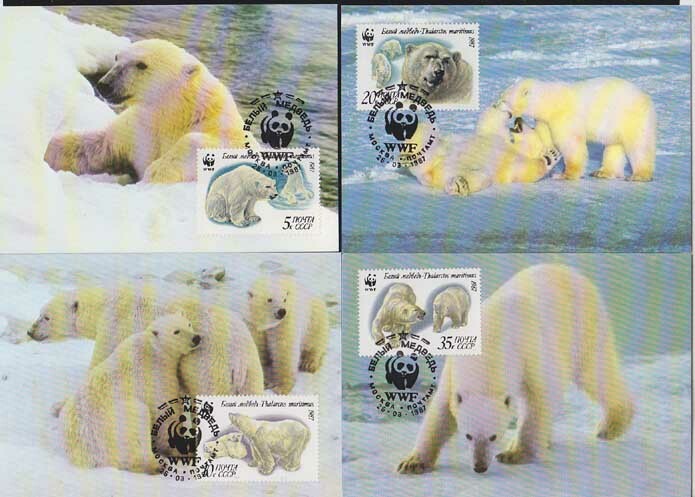 63522 MAX RUSSIA (1987) Polar bears*. Set of 4 maxicards with WWF thematic cancels. Scott Nos 5541-4, Yvert Nos 5391-4. 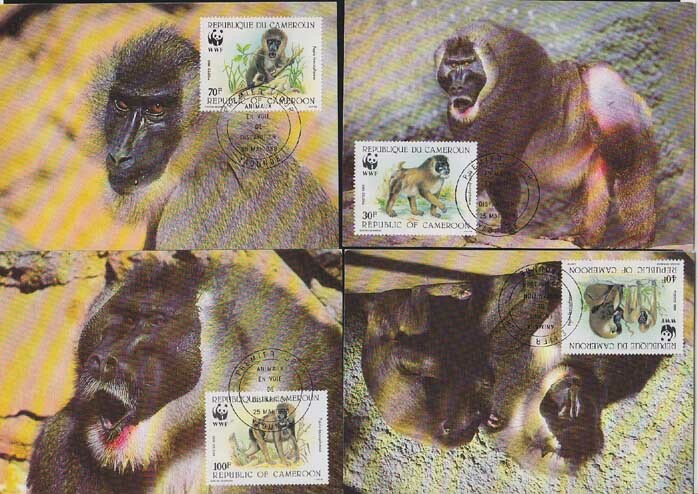 63502 MAX CAMEROUN (1988) Baboons*. Set of 4 maxicards with WWF thematic cancels. Scott Nos 843-6, Yvert Nos 822-5. 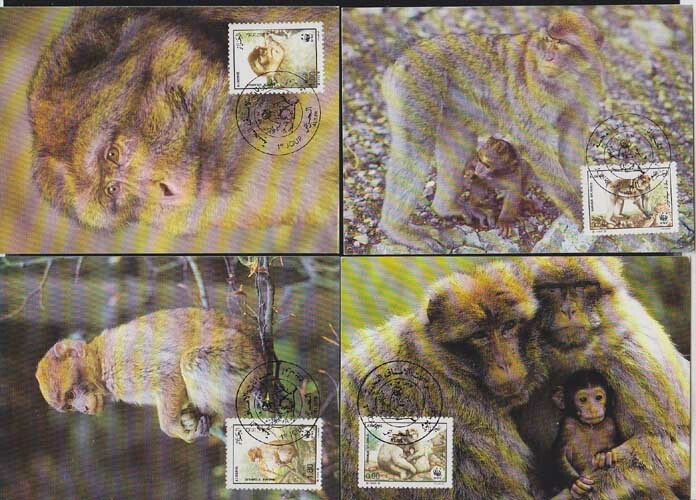 63496 MAX ALGERIA (1988) Barbary apes*. Set of 4 maxicards with WWF thematic cancels. Scott Nos 872-5, Yvert Nos 928-31. 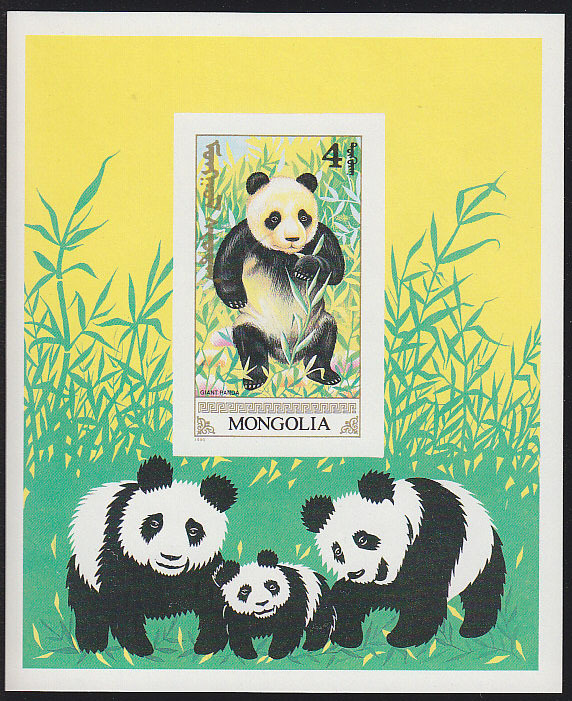 35268 SPE JAPAN (1988) Panda*. Japan-China treaty issue overprinted MIHON (specimen). Scott No 1805, Yvert No 1698. Beautiful! 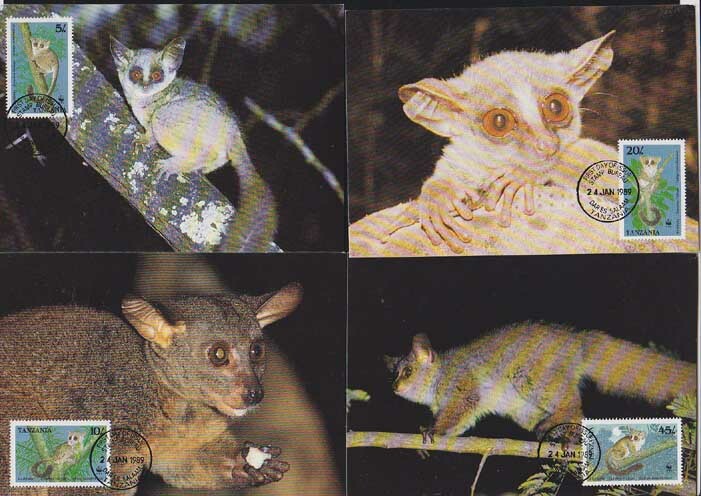 63530 MAX TANZANIA (1989) Bush baby*. Set of 4 maxicards with WWF thematic cancels. Scott Nos 468-71, Yvert Nos 444-7. 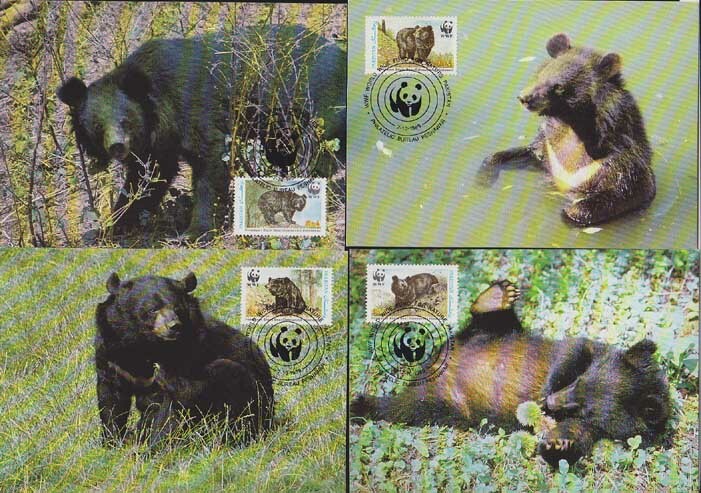 63520 MAX PAKISTAN (1989) Himalayan black bear*. Set of 4 maxicards with WWF thematic cancels. 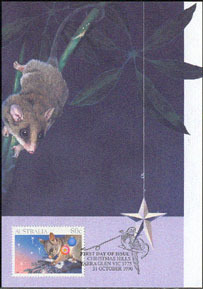 Scott No 718, Yvert Nos 743A-D.
43374 MAX AUSTRALIA (1990) Opossum*. Maximum card with thematic First Day cancel. Scott No 1196. 74425 ND MONGOLIA (1990) Giant panda family. Imperforate S/S. Scott No 1887. 49112 SPE NORTH KOREA (1990) Pig*. Goat*. Sheep*. Ox*. Horse*. Set of 5 overprinted SPECIMEN. KSC Nos 3016-20. Scott Nos 2940-4. 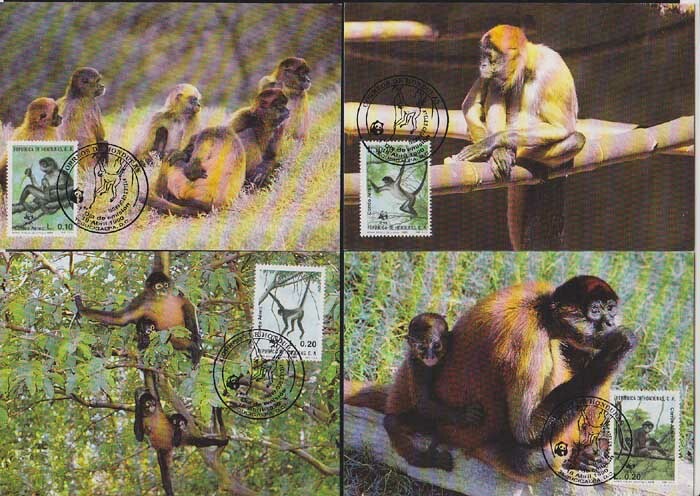 63509 MAX HONDURAS (1990) Geoffroy's spider monkey*. Set of 4 maxicards with WWF thematic cancels. Scott Nos C789-92, Yvert Nos PA743-6. 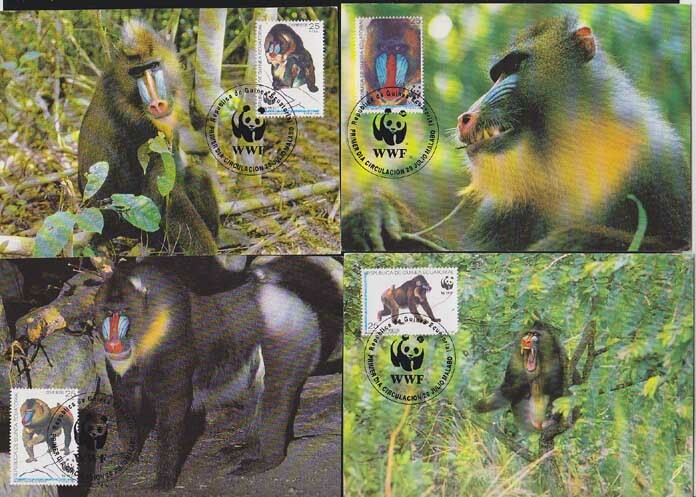 63506 MAX EQUATORIAL GUINEA (1991) Mandrill*. Set of 4 maxicards with WWF thematic cancels. Scott Nos 159-62, Yvert No 271-4. 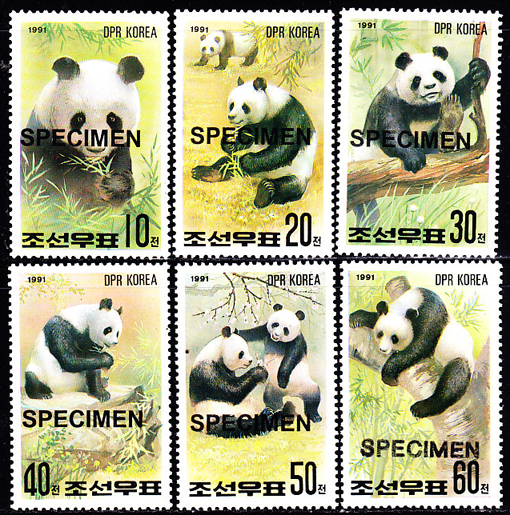 67883 SPE NORTH KOREA (1991) Pandas. PhilaNippon 91 Exhibition. Set of 6 specimens. Scott Nos 2962-7, KSC Nos 3041-6. 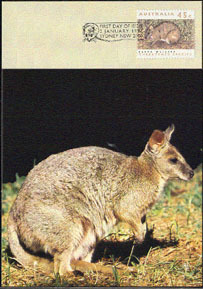 43325 MAX AUSTRALIA (1992) Parma wallaby*. Maximum card with thematic First Day cancel. Scott No 1241.